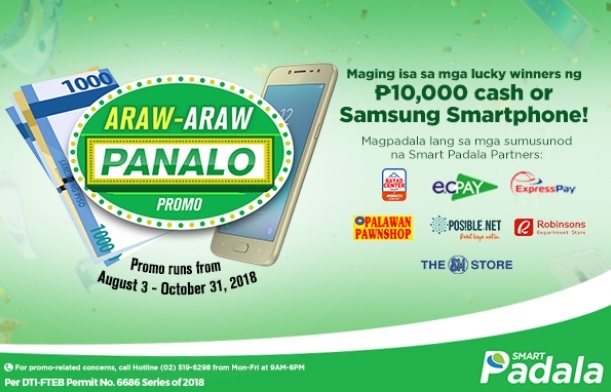 Smart Padala is currently running a raffle promo where money senders all throughout the Philippines can have a chance to win Php10,000 cash prize or a Samsung Galaxy J2 Pro smartphone every two weeks. The promo has already begun and will run until October 31, 2018. If you send money anywhere in the Philippines through Smart Padala via the following channels, you can earn one raffle entry everytime you do so from today until the end of October. There will be raffle draws every two weeks with the very first one already began on August 24, 2018. See draw dates below and its respective prizes. First, customers need to register via sms texting SMARTPADALA<space>REG<space>Full Name/Age/Adress and sending to 2948 for Smart, TNT, and Sun subscribers, and to 2117 for Globe and TM users. After the registration process and doing the remittance through the partner channels above, each customer must send SMARTPADALA<space>Reference Number and send to the same numbers mentioned above depending on your network in order to earn that electronic raffle entry. To learn more about this promo you can visit www.smartpadala.ph website or follow them on Facebook via @SmartPadalaPH.